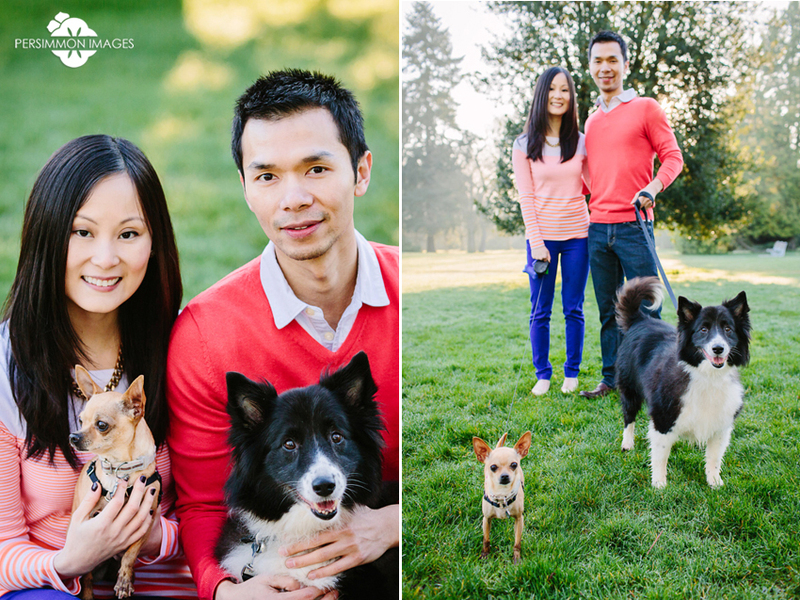 Around this time last spring, Janice and Chun and their two beloved doggies — Tippie and Gucci — spent a beautiful morning soaking up the sunshine at Volunteer Park and making some gorgeous engagement portraits with me. After the pups and their masters had a chance to play and frolic in the grass, we headed to Pike Place Market to enjoy some favorite landmarks — Post Alley and the gum wall, Penny the Pig, the flower merchants, and a secret spot tucked away behind the market sign where we took the last of the “snuggled up” photos in this post. Enjoy the happiness that emanates from these warm, playful, and stylish portraits. I hope they bring a little sunshine to today for you! For their engagement session, Emily and Eric requested that we re-visit the locations they went together on their long and much-loved first date. When she described the date to me, Emily mentioned that she knew there would be more to come because neither of them wanted the night to end even after it went on for hours and hours. Emily had to force Eric to leave her side, so she knew she’d see him again! Around Seattle we went with them, happy to oblige in reliving a wonderful day. Our first stop was Cap Hill for drinks to unwind at Cafe Presse (these two came from Tacoma, and traffic was — of course — a nightmare). Then, on to the iconic Pike Place Market with a stop at the Athenian and Post Alley, and finally sunset over the water at the Olympic Sculpture Park. All-in-all, a beautiful night… both for them to re-live, and for us to share with them. Thank you, Emily and Eric, for taking us along to share the memories and to create a new narrative for you to treasure! We met Shannon and Travis early one rainy Sunday morning at the Bindlestick Coffee and Beer House for a cup of coffee and a bit of getting-to-know-you. The weather was less than welcoming for a portrait session, but we decide to tough it out, and we’re so glad we did! That weekend was one of the last we expected to have colorful fall foliage on the trees, and with the way the rain was knocking them down, we knew we didn’t have much longer we could delay. While waiting for the drizzle to let up, we took some sweet portraits at the adorable Snoqualmie train depot — complete with vintage rail cars we could climb on. We decided to chance a (wet) trip to the Three Forks Dog Park with Shannon and Travis’s two pups, Palladin and Pearl. 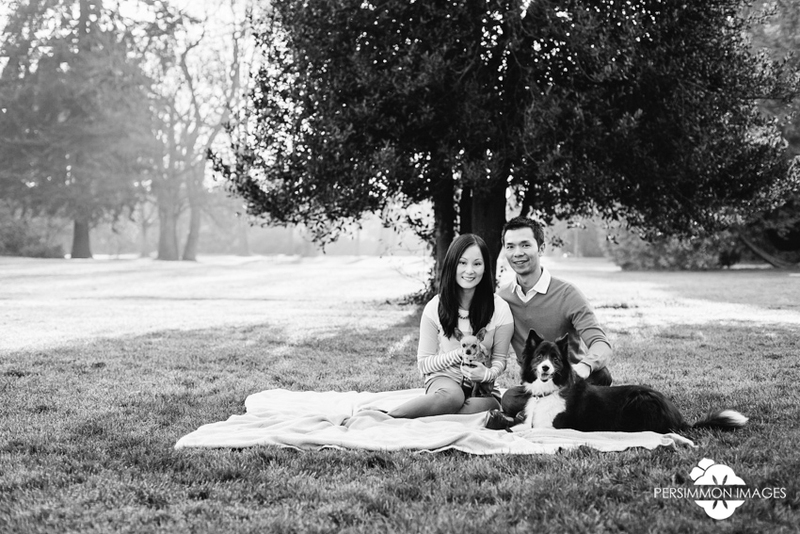 In addition to being a big part of their happy family, their pups were also there to witness Travis’s proposal to Shannon at Three Forks not long ago. 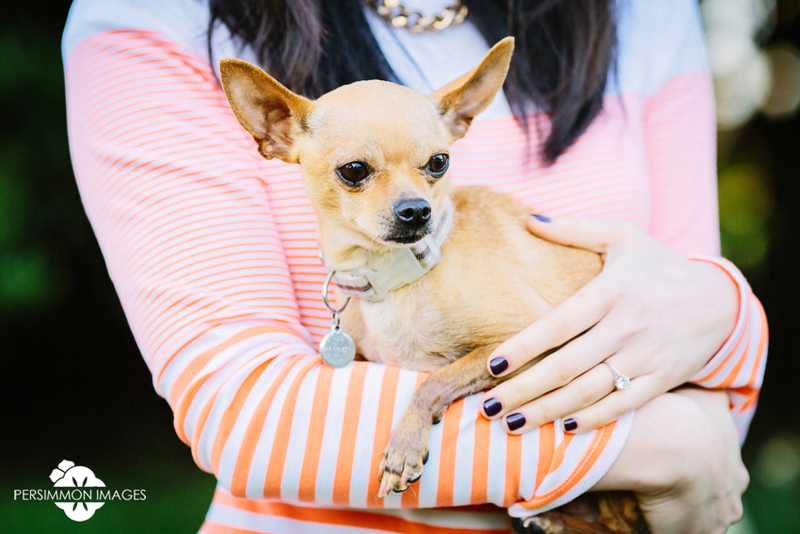 We’ve photographed engagements with pups before, but never at a dog park. This one was so much different from the mud pits we see in urban Seattle — wide open, full of grassy natural areas, and beautiful, to boot! By the time we got there, the rain had stopped! So, the dogs got to run and play while we spent some quality time with Shannon and Travis in their special place making the gorgeous fall engagement portraits you see below. We’re looking forward to celebrating their wedding day with them next month at Fireseed Catering on Whidbey Island! Want to see lots more? Check out their whole Snoqualmie engagement photography slideshow! We are expecting a baby in May, and so I’m on a crusade to do a bit of “nesting” here on the blog as well as around the house before I go radar silent when she arrives. I have a TON of engagement sessions and weddings from the last year an a half to share, so I’m going to make it a project to post one a week (in no particular order) for a little while. So much laughter, light, and love to show off! Let’s start with these summer engagement images of Lurline and Murray, taken in Seattle’s Ballard neighborhood, where they live. We love creating shoots around the things that couples like to do together — a sort of “double date” where we visit favorite places and do favorite things. Here, we started off with cocktails and Q&A to help us get reacquainted at Noble Fir’s happy hour, before wandering Ballard’s Old Town nooks and crannies, and taking a scenic stroll through Golden Gardens at sunset. In part, we recreated Lurline and Murray’s first date… and captured new memories along the way! Murray is an old college friend — we went to both J-School and the Honors College at the University of Oregon together! Like so many couples we see these days, these two soulmates found each other online and shared a love of classical music (listening AND playing) and fine food (Seattle foodies unite!). They both contribute awesome things to the world: Murray owns a letterpress design studio here in Seattle and Lurline is a teacher. And, of course, they complement each other in ways that it warms my heart to see. Lurline and Murray, I’m so happy you found each other. Thank you for inviting us along to capture your engagement and your wedding vows. We’re so happy to have you as a part of our lives. May your future hold countless sunsets and microbrews! Want to see more photographs? Watch their entire Ballard engagement photography slideshow! Seattle Wedding and Portrait Photographers Kat + Justin Speyer | © 2014 Persimmon Images|ProPhoto Photography Template by NetRivet, Inc.
We're Kat and Justin, the couple behind Persimmon Images. We're best friends, hiking partners, and aspiring world-travelers. He's a whiz in the kitchen, a rock climber, and an oncological nurse practitioner. She's a gardener, a long-distance cyclist, a meditating Buddhist, and a former Wedding Bee blogger. We're crazy, we're adventurous, and we collect new experiences like some people hoard cats. We believe in photography that captures who you are and how you love each other. Nothing forced, nothing fake, and nothing cheesy (unless it's funny-ironic-intentional cheesy). We think you deserve photographers who "get" you and, not only that, photographers who can capture your affection and joy, and all the funny quirks of the person you fell in love with so that you can always appreciate each other when you see the gorgeous images we make together. We pride ourselves on handmade, heartfelt documentary photography and portraiture with an artistic eye. We'll travel anywhere and climb on anything for that one amazing shot. We work with no more than 15 couples each year to give each of you an unforgettable experience and the highest quality of service. You're different? We're different. Let's show the world how awesome different can be. Be the first to know about seasonal promotions, special deals, and big news straight from us!